From being used for medical applications in the 1970’s, CT technology has transformed into a conventional method of testing and inspection for industrial applications. With the use of an X-ray source, detector panel and a rotary table, users are able to access accurate internal and external data set of a testing subject. As a part rotates 360 degrees on a rotary table, a pre-determined number of 2D x-ray cross sectional slices are captured, depending on the amount of data required. When the first CT scanning instruments were introduced in the 1970’s for medical applications, finite-series expansion algorithms, algebraic reconstruction techniques and simultaneous iterative reconstruction techniques were utilized for reconstruction of the cross-sectional slices and data sets. These methods of reconstruction have become obsolete for commercialized industrial CT scanning instruments, due to their lack of speed. For use of industrial CT systems today, transform methods, a restorative algorithm (based on analytical inversion formulas) are implemented as they as much faster than traditional methods of reconstruction of CT data set. This method of reconstruction also allows for far greater image quality and accuracy. Once the data set has been re-constructed into a 3D rendering, users are able to access internal and external part features including geometries, failures and explore the interaction of internal structures and assemblies. Match the part size and material to the appropriate x-ray source with high or low energy exposure depending on the purpose of the scan. Place the part on the rotary table – located between the digital detector panel and x-ray radiation source. 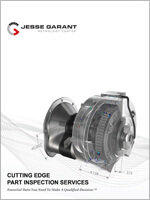 Ensure that the system has been closed shut before beginning CT scanning process. Begin the radiation exposure process. As the part rotates 360 degrees, the x-ray source penetrates through the part. The varying density of the part absorbs varying amounts of radiation. The remaining radiation travels to the detector panel, which captures a 2D x-ray image. This process is repeated to capture hundreds to thousands of 2D x-ray images. Several hundred to thousand 2D x-ray images which are captured are reconstructed mathematically to develop a 3D rendering or a 3D model of the part being scanned. This model is used for further internal and external analysis of the part, whether it is to identify internal failures or to conduct a dimensional analysis. Interested in the technology for a possible project? Visit our CT service page. What determines X-ray Computed Tomography image quality? Size of the part being tested – a detector panel is used to capture all the 2D x-ray images, while the part is on an axis of rotation. If the object being scanned does not fit the detector panel, the resulting image will not reflect the object in its entirety. It is extremely important for radiographers to ensure the object being inspected is within the detector panel size range. If the part is too large, the resulting image will not be representative of the entire part. 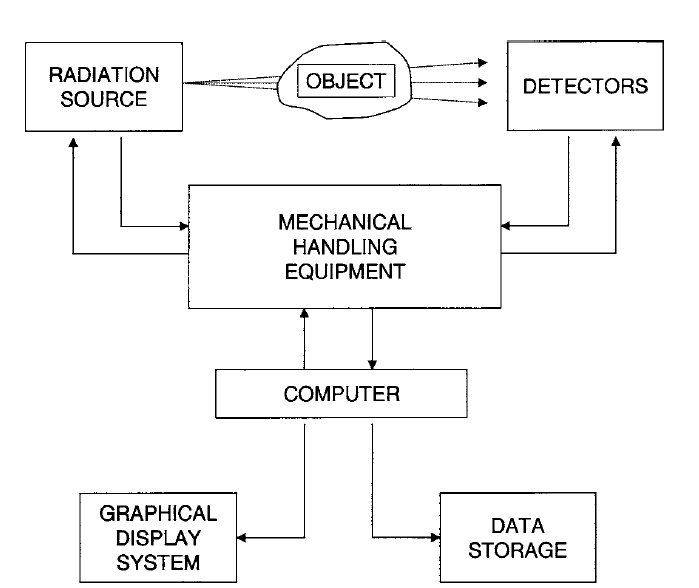 The radiographer may need to utilize a system with a larger detector panel or scan the object as many times as required to capture the entire object and analyze results individually. However, if only a certain area of the testing subject needs to be inspected, it may not be necessary for the subject to fit the detector panel size range, given the area of interest fits within detector panel size range. Orientation of the x-ray source subject to the part – The distance of the x-ray source and the part plays a significant role in determining the accuracy and the quality of the image. The part, depending on the size and the purpose of the scan, can be placed closer to the x-ray source to detect a certain area or can be closer to the detector panel to capture part in its entirety with enough exposure of radiation. 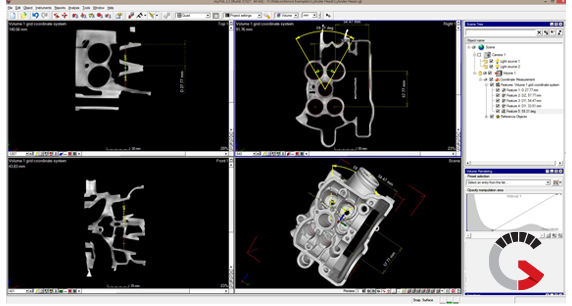 Material of the part being scanned – Density of a part determines the quality of the resulting scan. The higher the density, the more exposure of radiation required to evaluate internal features. With lower density objects, less exposure of radiation is required. If too much exposure is passed through a low density material, the resulting scan will display scattered data. If not enough exposure is passed through a high density material, viewers are not able to retrieve accurate data. Amount of 2D cross sectional slices developed – Depending on the resolution required for the purpose of a scan, the amount of 2D cross sectional slices can be determined. If not enough cross sectional slices are captured, the resulting image will not display a highly accurate result. If more 2D cross sectional slices are captured, higher accuracy of the resulting scan is possible, for the reconstructed 3D model. The resulting scan is a set of voxel based data portraying the varying density of the part, in varying grayscale value. Density of a part absorbs the radiation which is exposed to the part being scanned. Since the cracks or voids do not absorb any radiation, they will appear with a higher density on the resulting image – darker on the greyscale value. The areas with high density material tend to absorb more radiation, thus, appearing lighter on the greyscale value. The images are analyzed similar to any x-ray or radiographic testing technique. For X-ray CT scanning, a 3D model is reconstructed, which can be further analyzed for internal failures, measurements and wall thickness, to name a few. The results can be color coordinated according to project requirements to ease the visual of analysis. The detection system converts the transmitted radiation into an electronic signal. The detector element is typically a scintillation detector that is optically coupled to a photo-conversion device such as a photodiode or photomultiplier tube. Alternatively, some systems use other types of detectors. For fan-beam type systems, the in-plane detector width is determined in part by the spatial resolution requirement. This detector width is either designed in the system or, for variable aperture systems, can be set by some kind of shielding aperture plates that define the detector’s field of view. The detection system may consist of a single sensing element, an area array of sensing elements, or a linear array of sensing elements. The more detectors used, the faster the required scan data can be collected; but there are important trade-offs to be considered. (1) A single detector provides the least efficient method of collecting data but entails minimal complexity, eliminates concerns of scatter between elements, differences in detector response, and allows an arbitrary degree of collimation and shielding. Translation motion is required for two dimensional reconstructions and elevate motion is required to create three dimensional reconstructions. (2) An area detector provides the most efficient method of collecting data but entails the transfer and storage of large amounts of information, forces trade-offs between scatter, elements, and detector efficiency, and creates serious collimation and shielding challenges. However, using cone beam reconstruction algorithms three dimensional renderings of the object can be made. (3) Linear arrays have performance characteristics intermediate between these two extremes, for example, reasonable scan times at moderate complexity, acceptable scatter between elements, and differences in detector response. Linear arrays have a flexible architecture that typically accommodates good collimation and shielding but require elevate motion for three dimensional reconstructions. In some cases, several linear areas are combined to allow faster scans while keeping some of the collimation benefits. (4) An important aspect of the detection system is the electronics system used to convert the analog signal received to a digital stream for processing. The front-end analog electronics amplify the detector signal to a magnitude that can be digitized. Fast systems demand good fidelity of the amplified signal. What makes the task especially demanding is that many signals, differing by several orders of magnitude, are frequently multiplexed on the same line in rapid succession; intersignal amplification rates are measured in microseconds. The analog to digital (A/D) conversion is performed as close to the analog amplification chain as possible. 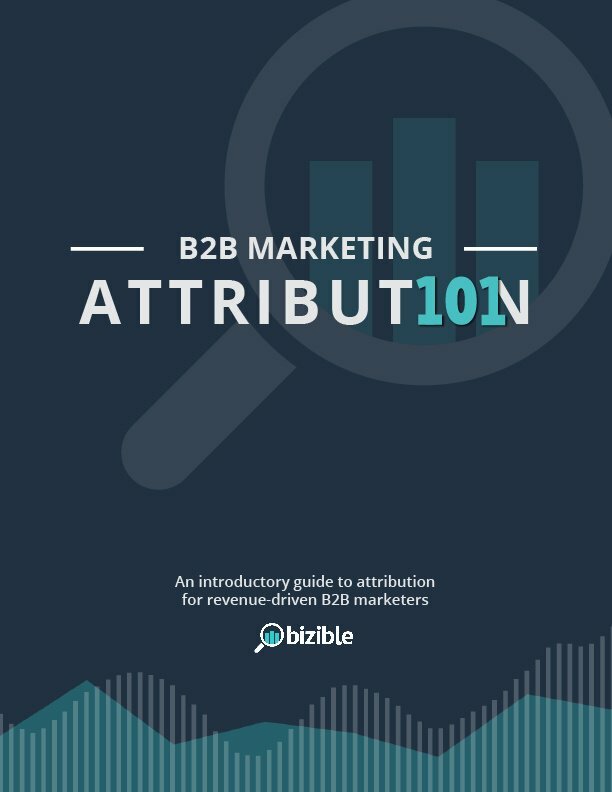 The accuracy requirement of the A/D must be consistent with the statistical limitations of the largest and the smallest detectable signals. 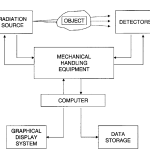 The object manipulation system has the function of holding the object and providing the necessary range of motion to position the object area of interest between the radiation source and detector. Since spatial resolution is limited by many things, including the relative position of the object with respect to the source and detector, any problems with alignment or accuracy of the mechanical system will show up as degraded resolution. It is typically more difficult to align hardware for translate-rotate motion machines, but the sampling rate is adjustable up to some limit. In contrast, rotate-only motion machines typically are not as difficult to align, but they do not give the option of adjusting linear sampling to satisfy the required sampling rates. In either case, artifacts occur and the resolution is degraded if alignment is compromised. (1) Because the inherent resolution of a system can be degraded by the mechanical handling equipment, fine spatial resolution requirements can drive mechanical designs and tolerances to extremely high costs. Typically, system designs can accommodate spatial resolutions up to some limit. Beyond that limit, redesign with different, more accurate system components and different assembly procedures is required. Our specialized CT services provide accurate internal and external scan data along with easy to view results.